Last week, McAllen hosted the North American Nature Photography Association’s annual Summit. It was a great opportunity to learn more about photography and to see the work of some great photographers. 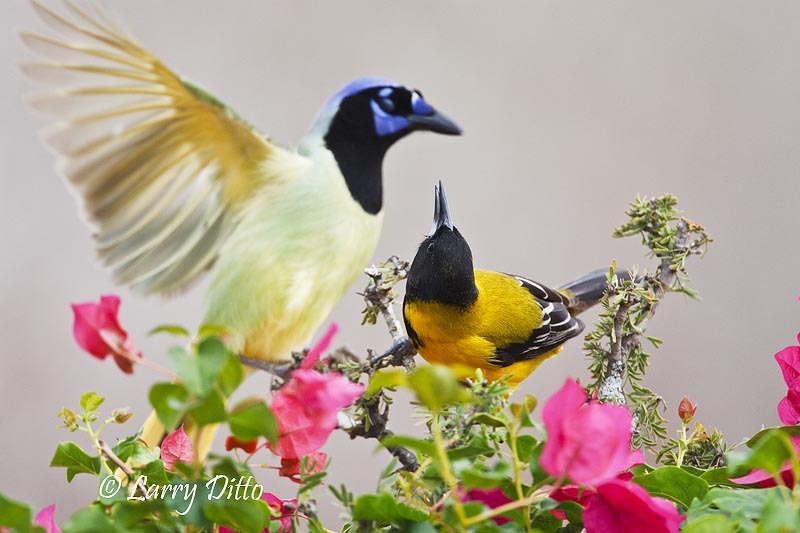 It’s funny though, that those of us who live here think we do a great job of advertising the photo opportunities and birding in south Texas. 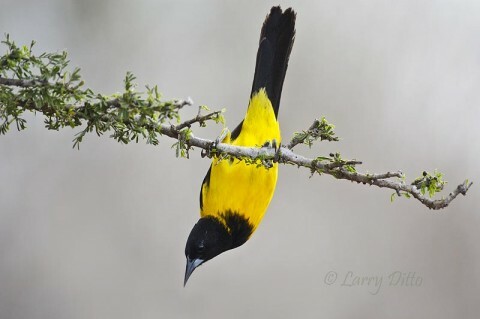 To my surprise, many of our visitors said they had never heard of McAllen or its bird resource. Of course, I wasn’t surprised that those who attended the Summit had a lot of fun; many even allowed a few extra days for photography. On Monday, I guided two ladies for a one-day trip to the Santa Clara Ranch. 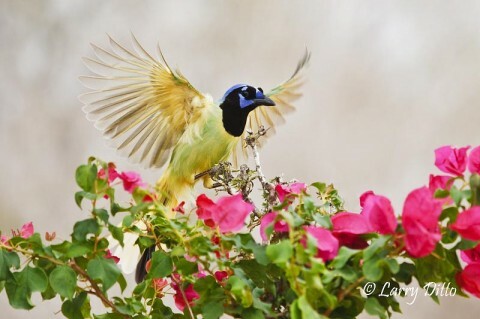 Sandy Richards of Alamo, California said “it was the best day of photography I ever had!”. The following day, Dave Welling, Allen Dale and I headed up river about 120 miles in search of the elusive white-collared seedeater. Allen had photographed them about 5 days earlier and got some pretty nice photos. But for Dave and me, they are still “elusive”. Enough said! 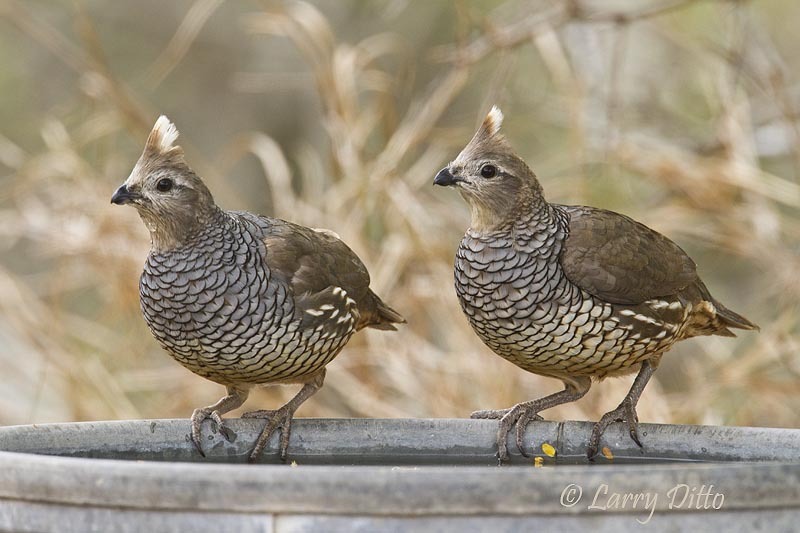 Allen saved the day by taking us to Falcon State Park where we photographed scaled quail and a pair of roadrunners building a nest. I can’t wait to visit that location again next month. Yesterday, I spent a couple hours at the Edinburg Scenic Wetlands hoping for photographs of green kingfisher. Ditto on the “elusive” part, but the duck photography was great. With the migration under way, I hope to get back there soon. 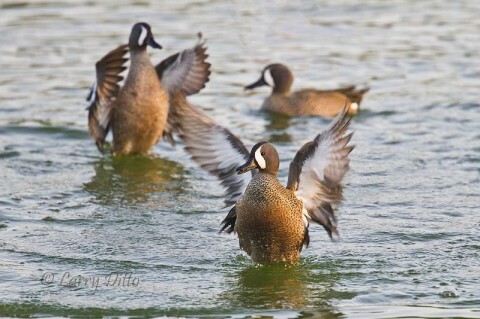 Here are some of the birds I photographed this week. You will note that I added a flowery prop to one set to punch up the color. I simply placed the flowers in a location where I wanted the birds to land, placed a perch twig behind the flowers, and put half of an orange (out of sight) at the bottom of the perch. Several birds fought over the orange and the activity was intense all morning. Remember, click on the photo and it will open to a larger, sharper format. Then you can click the upper righthand area to advance through the photos. The shots with pink flowers are all at the same setup. The flowers are bouganvillas. I used the 100-400 mm zoom lens to allow room for capturing landing birds through a rapid fire sequence of shots. In a wetter spring, there would be enough native flowering plants to color up the background without hauling my wife’s potted plants to the ranch. Green Jays and Audubon's Orioles occasionally fought over the fruit hidden below the perch. One could manipulate the green jay’s eye and insert a clear one to create a prettier photo, but the nictitating membrane shows that birds blink like we do when threatened by the striking beak of another bird. 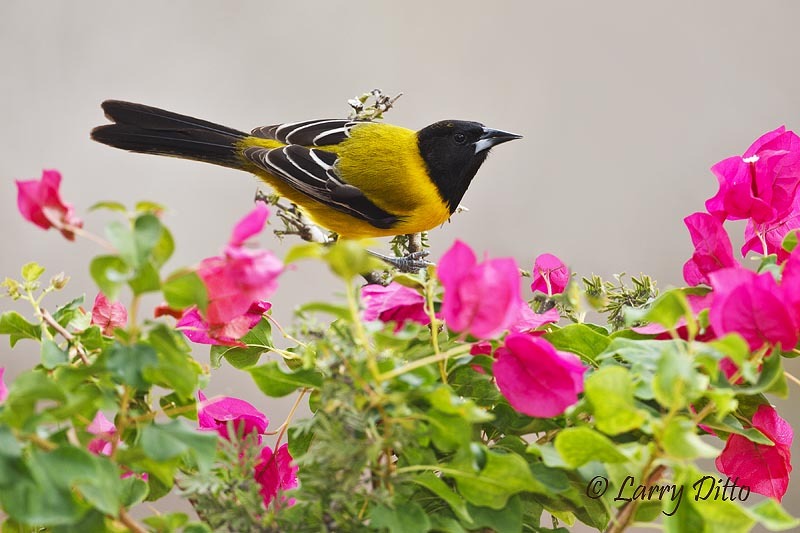 If flowering shrubs are available, they are more colorful and interesting perches than a stump or bare branch. When a bird lands on my setup, I often keep focused for several seconds in case some interesting action or posturing occurs. In this case, the wings spread as the thrasher turned to face me. Scaled Quail drinking from an over-turned trash can at a brush country camp site. 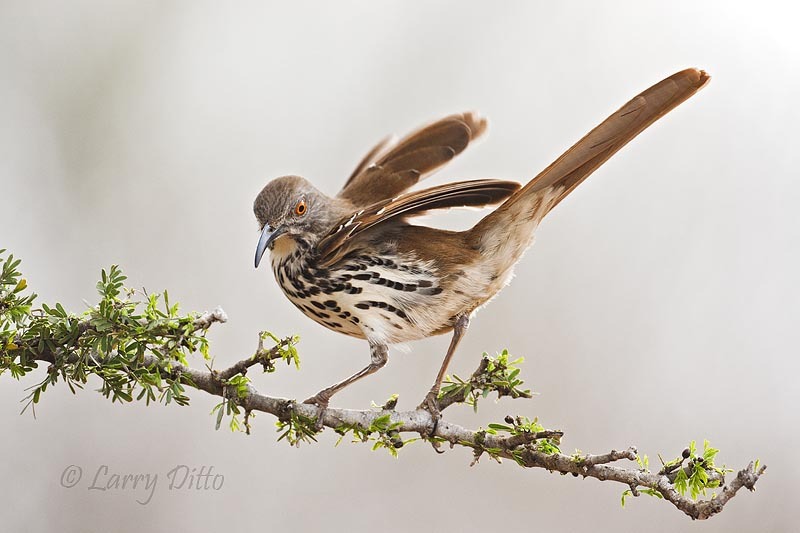 Desert birds, and probably most others, can be trained quickly to take their water from man-made devices. In this case, a camper at Falcon State Park simply overturned an unused trash can and filled the bottom with water for the birds. 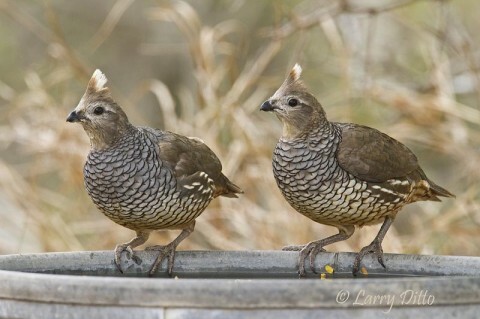 You may know scaled quail as blue quail and cotton-tops. Greater Roadrunner with a leaf for the nest. This greater roadrunner wasn’t much help with the nest building. While its mate gathered and installed sticks, this one pecked around at the light stuff but never did much real work. This is what I look like when there is housework to be done. 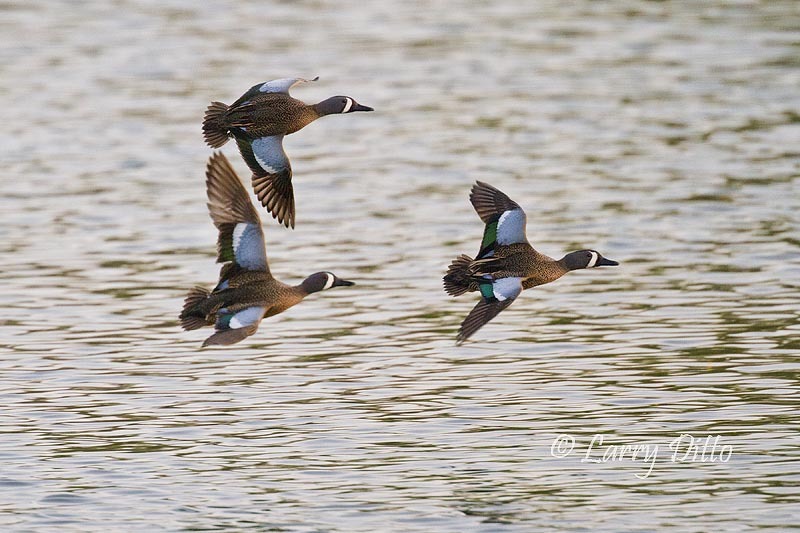 Several blue-winged teal are spending a few days at the Edinburg Scenic Wetlands. I got this shot using a 500 mm lens and 1.4X teleconverter with the Canon 7D camera set to ISO 800, 1/2000 second @ f 4 in early morning cross-light. Blue-winged Teal drakes (males) stretching. 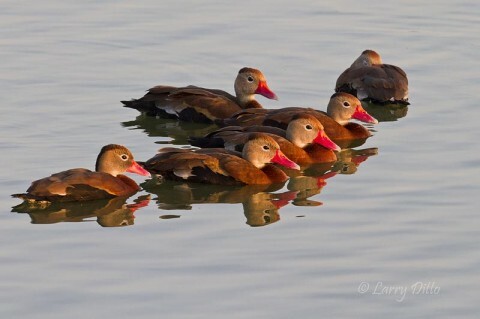 Black-bellied Whistling Ducks at sunrise. These whistling ducks were easy to approach for a sunrise shot at the Edinburg Scenic Wetlands. 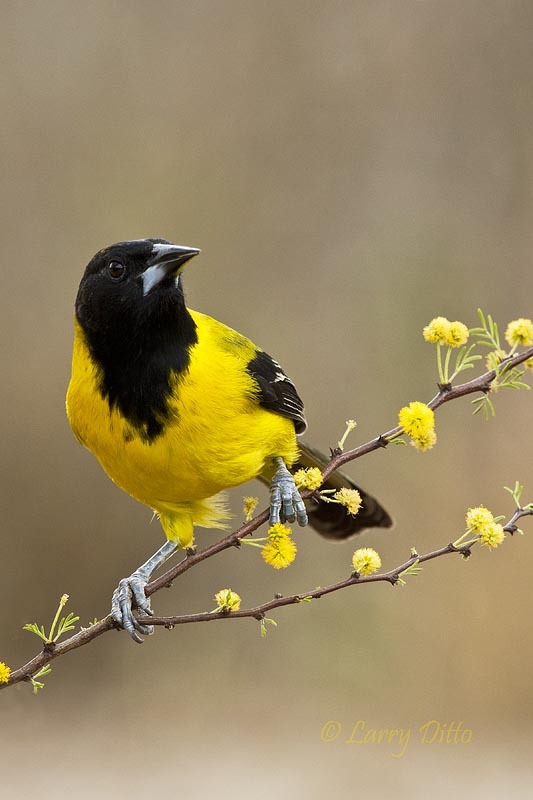 The wetlands are an excellent place for waterbird and butterfly photography, especially for local photographers who don’t have the time for a long drive to other habitats. That’s it for this week. I hope all of you are enjoying good spring weather. The roadrunner is my favorite. Great pose!! I love the oriole with the green jay in the background. Green Jay looks like he is NOT MESSING AROUND! 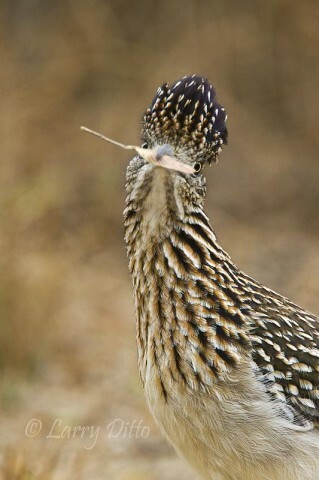 Of course, the Greater Roadrunner is my “elusive” bird. I have to have pics of the roadrunner. And, my favorite is the ROADRUNNER shot! I can just see you running around looking for the white-collared seedeater . . . hell, I wouldn’t know what a white-collared seedeater even looks like let alone try to photograph it.